One of my favorite emails is the daily email I receive from Chow. 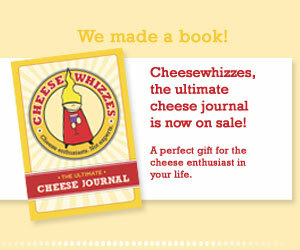 Today’s was so appropriate for our cheesy recipes, I could hardly help myself. From the email itself: To complement the pleasant mustiness of Taleggio cheese, we paired it with grapes bathed in grappa. Delicious for lunch, this sandwich would be equally good cut into rectangles as a quick hors d’oeuvre. What to buy: Grappa is a distilled grape liqueur from Italy; it can be found in high-end liquor stores and online. We liked the floral notes of Inga Grappa di Moscato, which doubles as a nice after-dinner drink. Taleggio is a washed-rind, semisoft cheese from Italy’s Lombardy region. This recipe was featured as part of our The Most Delicious Sandwiches photo gallery. Combine grapes and grappa in a bowl and let macerate for 15 to 20 minutes. Drain off excess grappa. Heat a large frying pan over medium-low heat. Meanwhile, spread butter on 1 side of each slice of bread. Once the pan is warm, add 1 slice of bread buttered side down, and top with 1/2 of the cheese, all the grapes, and finally the remaining cheese. Close with the second bread slice, buttered side up. Cook until bread is toasted and cheese is melted, about 3 minutes per side. Beverage pairing: Calera Central Coast Pinot Noir, California. Taleggio can be a strong, musky cheese, so it needs a wine of equal conviction, but with a taste of earthiness itself. That’s why Pinot is a good call, and this well-made wine from California’s Central Coast has all that’s needed to both match the cheese, but also resonate with the grapes. I made this for tonight’s Cookbook Club. And what do you know, the girlies went wild over it! 2. Toast bread crumbs on a baking sheet with sides until golden, about 5 minutes. Cool on sheet on a rack. 3. Bring milk just to a boil; remove from heat. Melt 2T butter in heavy saucepan over moderately low heat, add onions, and cook, stirring until softened (about 5 minutes). Reduce heat to low and stir in flour, salt and pepper. Cook, stirring for 3 minutes to make a roux. Add milk in a steady stream, whisking constantly, until sauce is smooth. Simmer, whisking occasionally for 20 minutes. 4. Add Cheddar and cook, stirring until just melted. Remove from heat, cover surface of sauce with was paper (to prevent a skin from forming), and let cool. 5. Preheat oven to 400 degrees F. Butter a 2 1/2-quart baking dish. 6. Cook cauliflower in a 4 to 5-quart heavy pot of boiling well-salted water until tender (about 10 minutes). With a slotted spoon, transfer cauliflower to a bowl of ice and cold water to stop the cooking, the drain well and pat dry. Transfer to buttered baking dish. 7. Melt remaining 2 T butter and toss with bread crumbs. Pour Cheddar sauce over cauliflower and sprinkle with bread crumbs. Bake until sauce is bubbling, about 15 minutes.